Hearts are to close a section of Tynecastle after crowd trouble marred last weekend's Edinburgh derby. Chairman Ann Budge said a "number of incidents emanated" from one part of the Wheatfield Stand, which would now be shut for the final two home games of the season. Around 200 supporters will be moved elsewhere in the ground. Budge said seven pyrotechnics were discharged or thrown onto the pitch - four from Hearts areas and three from the Hibs section - on Saturday, as well as coins and hot drinks. A coconut was also hurled from the stands and racist abuse was directed at players during the derby. 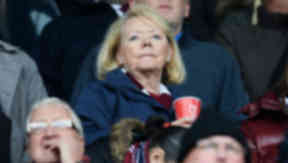 Budge had previously warned that she would take action if there continued to be disorder during games at Tynecastle. Just hours earlier on Thursday, manager Craig Levein called for fans who shame the Scottish game to be banned from stadiums for life. In a statement, Budge said the club's £1m pitch risked being damaged by pyrotechnics and added that Hearts would spend £100,000 upgrading CCTV in the ground. She said: "I have said before that we will continue to take action to drive this behaviour out of Tynecastle Park ... and I know that I have the support of all fair-minded Hearts supporters in our efforts to eradicate this behaviour. "Since a number of the incidents mentioned above emanated from lower section G of the Wheatfield Stand, I have given instructions to close this section with immediate effect. "Season ticket holders within this section will be offered seats elsewhere in the stadium for the remaining two games of the season. I apologise to any 'innocents' who are caught up in this. "I want to stress that this is not something we do lightly. This will impact close to 200 season ticket holders and as such, will cost the club financially."